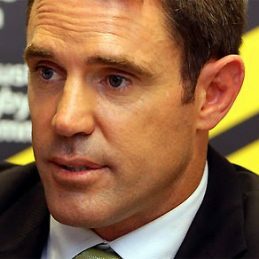 Fittler’s first grade career started in 1989 at the Penrith Panthers while he was still in high school. He played in Penrith’s 1990 Grand Final loss, then in the Premiership winning side of 1991. In 1996, he joined the Sydney Roosters where he played nine seasons, captaining them to the 2002 Grand Final victory. Fittler is second behind Terry Lamb as the most experienced first grader, having played 336 games, scoring 122 tries. He is now seen on Channel 9’s Rugby League coverage and is the NSW Blues Coach. Brad is one of our most in demand NRL speakers. His stories from his playing days are hilarious and give a great insight into the game. He also talks on Leadership, Building Cultures, and Building High Performance Teams.